This is a support image for the Maconiana Severiana Sarcophagus image. It is titled as the Triumph of Dionysus and the Seasons Sarcophagus. As our original piece, it depicts Bacchic figures, as well as the Four Seasons and Mother Earth. It is from the Late Imperial Gallienic period and has been dated between the years of 260 and 270, C.E. 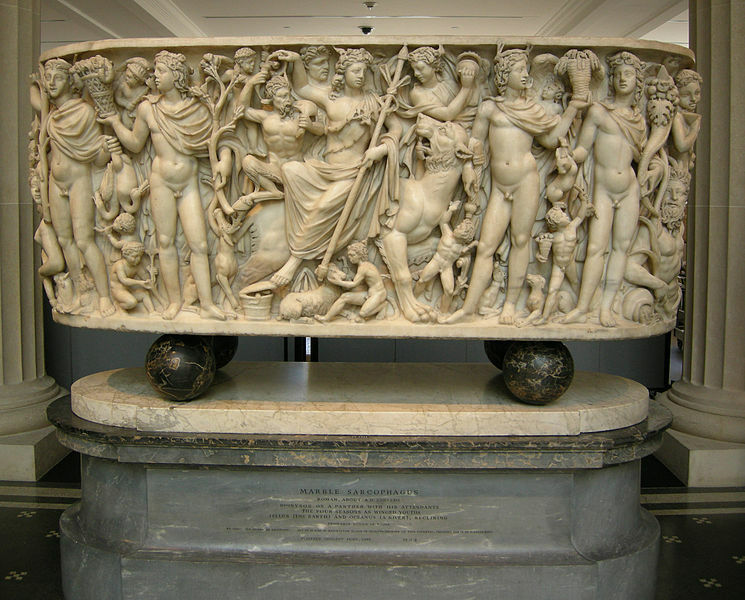 The sarcophagus is made from marble and its overall dimensions are 34 x 85 x 36 ¼ inches. While the back of the sarcophagus has been left quite bare, the front and ends have 40 human and animal figures that have been carved with a high amount of relief. It had been found in the early 18th century and installed in a Badminton Hall in Gloucestershire, England, in 1733. The sarcophagus has been preserved almost intact and is only missing a few minor extremities. It was donated to the Metropolitan Museum of Art, in New York, in 1955, on behalf of the Dukes of Beaufort.